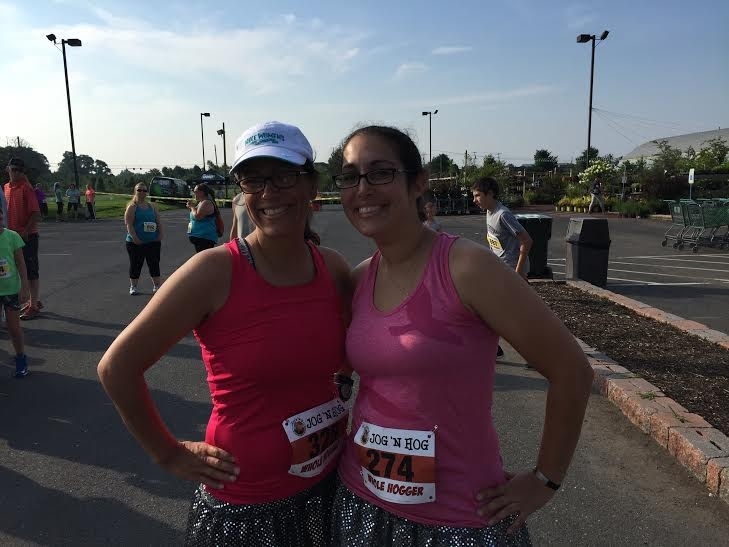 Sometimes, okay… often, I succumb to peer pressure when it comes to races. 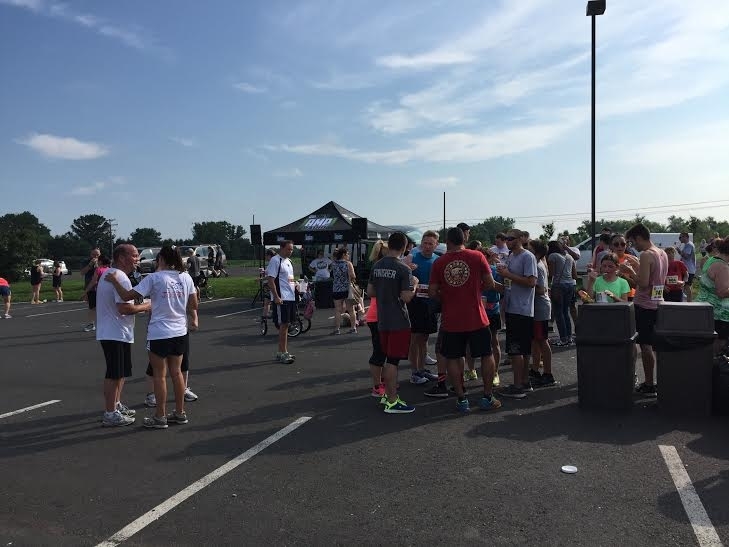 The past two years, I’ve been a half hogger, which, in the most technically terms possible, means running a 5k while scoffing down a pint of ice cream smack dab in the middle. I told anyone who would listen. And even some people who probably didn’t listen. I’m going to run! AND EAT A WHOLE QUART OF ICE CREAM. And run! Never mind the fact that I’ve never eaten a whole quart of ice cream, in my life. Heck, it was a challenge the past two years to eat the pint size. But I was committed! I was excited! What is “this” exactly? 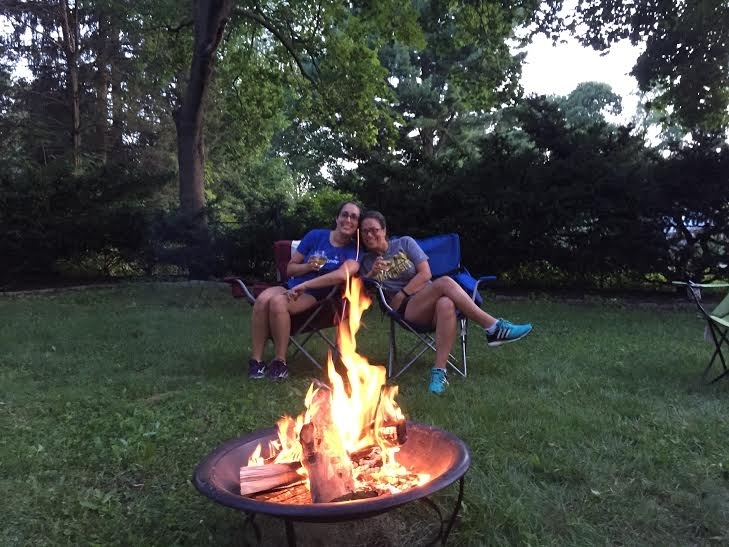 Victoria and myself in my yard. With wine. And s’mores. And a dinner of popcorn. Oh, and frozen yogurt before that. Pre-gaming like CHAMPS. TL;DR – the gist? 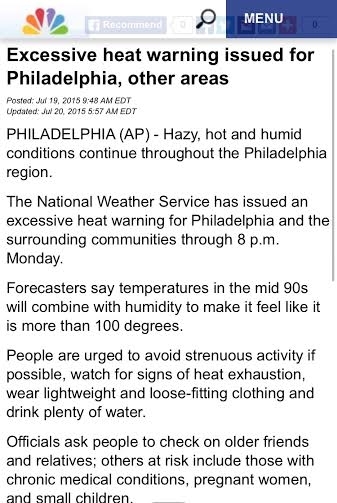 HEAT WARNING. Grab your personal belongings and run to the nearest air conditioner unit! The news said we needed to AVOID strenuous activity. So naturally the logical conclusion was to head out to Shady Brook Farm (I call shenanigans with that name, by the way. Not much shade!) and prepare for the Jog ‘n Hog. 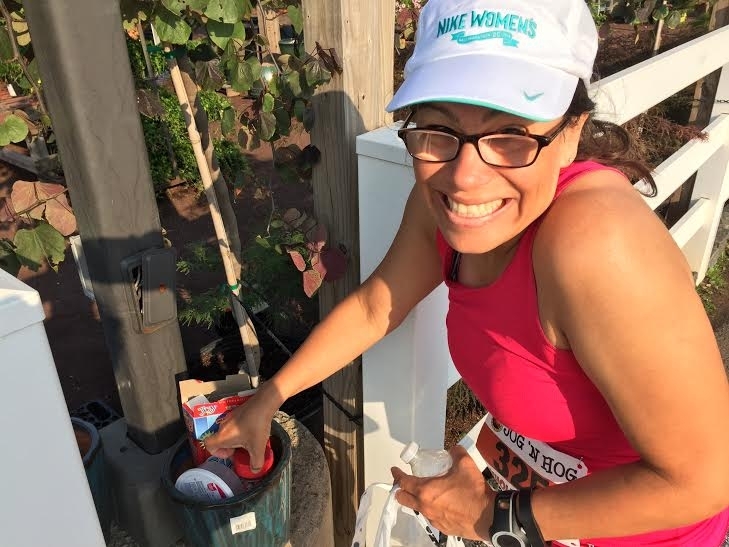 I love races that have race morning packet pickup, in fact I vote that all races should. Stopped by, got our shirts and bibs, and said hello to the Brothers Smith, the co-creators of the Jog ‘n Hog. Parking and the start are pretty much right next to each other and the “hogging” area is a roped off area with a local radio station providing fun tunes. 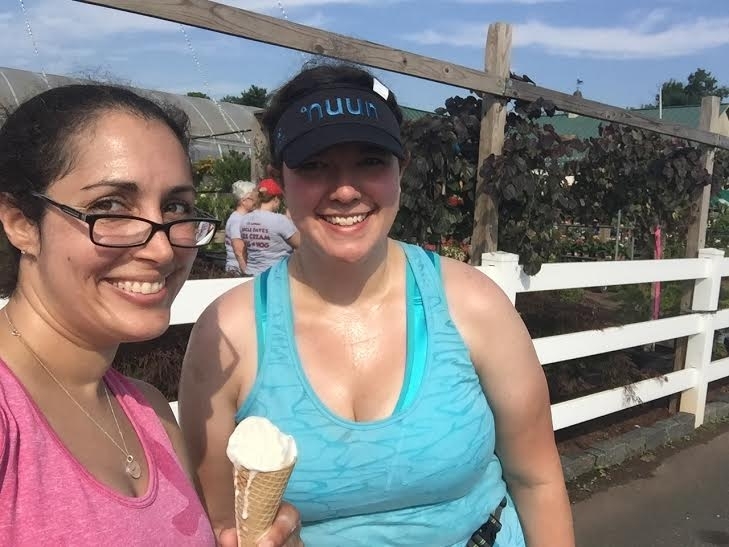 Vic and I brought sprinkles and cones this year and were trying to figure out the logistics of how we’d run (or walk – I’d already declared that I was going to be walking – my plantar fascia is still acting foolish) when we saw the hogging area lined with planters. Yes and yes. We figured that if anyone else stumbled across our toppings, they could use them too! Soon after, we ran into the lovely Jes of Runs and Crafts! She’d done a triathlon the day prior (or well, part of one, the run got rained out!) and she was very cool hanging back with me while Victoria decided to take her jogging and hogging more seriously. She had her eye on the prize! I give major kudos to anyone dressed up at this race because honestly, if nakedness were a viable option, that probably would have been the preferred choice of many. We found a Spoon! She made her costume and said she had a plate in the crown to make it stand up. That is dedication! We lined up near the start and about 10 minutes later, we were off. Note to the Jog ‘n Hog bros, we couldn’t hear you in the back with the megaphone. Nope. Not a word! But that’s okay because I know the drill. Jog. Hog. Jog. There’s a water stop along the way out (and again on the back) and decorations from both Halloween and Christmas. I was sweating before we even started and let me tell you, salt in the eyes does not feel so awesome. Jes and I had a fast walk going on and we chatted the entire way. I’m sure this surprises approximately no one! As we neared the hogging portion of our experience, we found Vic peeling out of there. She ate the WHOLE thing. We grabbed our Uncle Dave’s ice cream (Jes wisely registered for the pint). I figured that maybe sprinkles would help the cause. 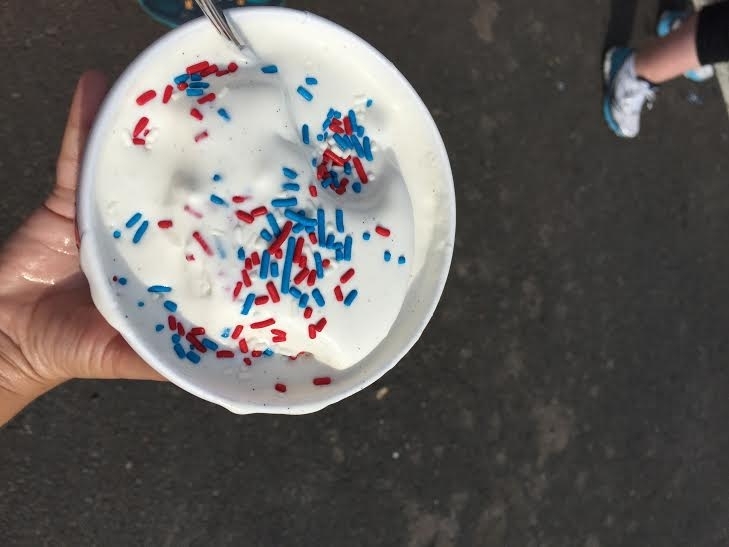 Eating all the sprinkles, it was more like soup than ice cream. 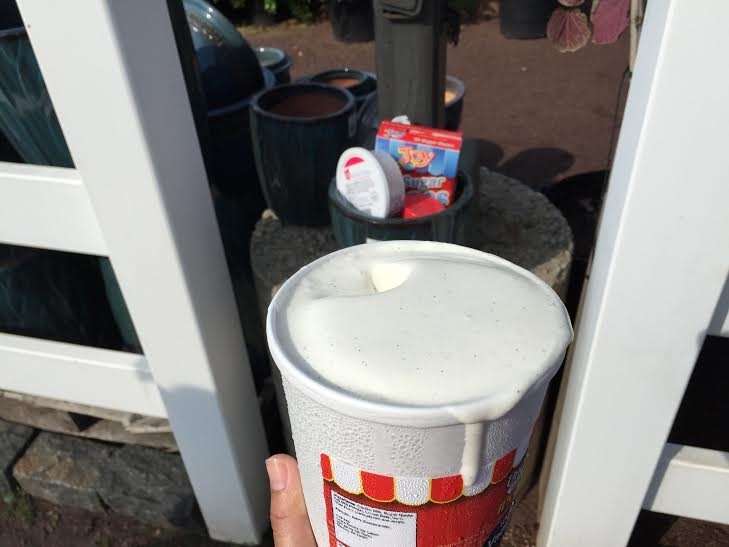 I would have done well drinking it except that there was still a solid mass in there too and I was afraid that it was going to fall directly on my face. I was melting. The ice cream was melting. We were all melting. MELTING. Don’t judge me fellow Jog ‘n Hoggers! So, I decided that I was going to take some ice cream for the journey to the finish in a cone. Because I was bound and determined to use at least one cone! I felt bad throwing away so much ice cream. Because seriously, there are children starving around the world and waste not, want not and a whole slew of other saying that I could break out here. How much ice cream did I eat? I’m pretty sure it was less than a pint, which is truly pathetic. 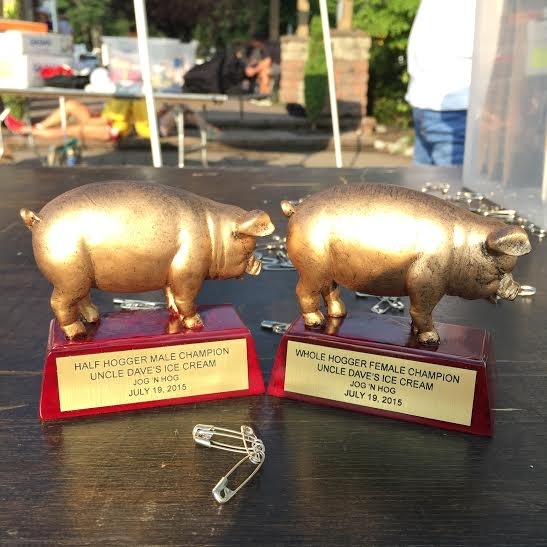 Will next year be the year I actually conquer the whole hog? I guess we’ll just have to wait and see! 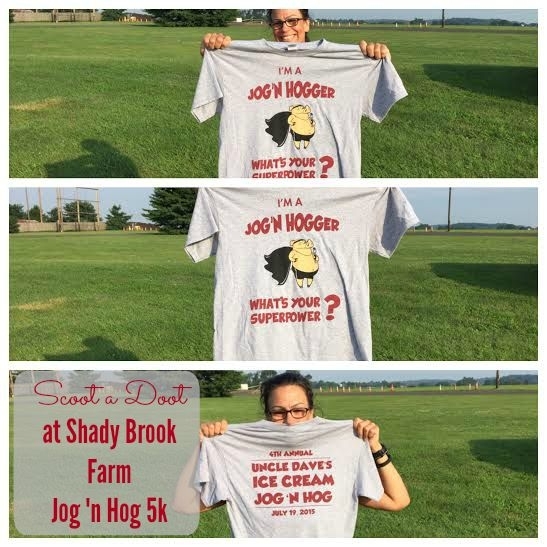 Thanks to Jog ‘n Hog for providing us with complimentary entries this year. You rock! No other compensation was given. 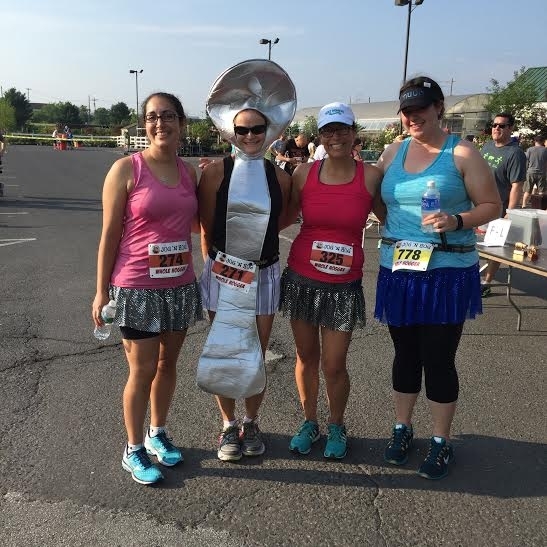 This entry was posted in Uncategorized and tagged ice cream, jog 'n hog, national ice cream day. Bookmark the permalink. It was SO HOT on Sunday. 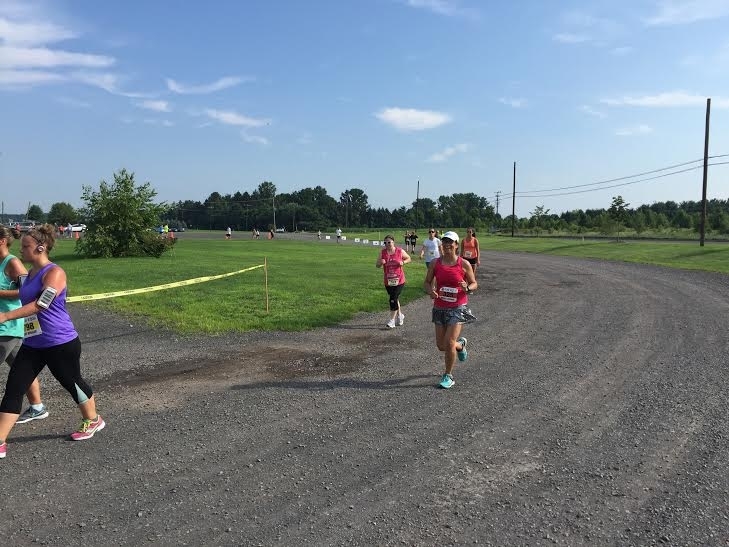 I was struggling to finish my 12 miles… without ice cream. I don’t know how you were even moving around outside with ice cream sloshing around in your belly. HOW. How did you do it?! I’m impressed. Just impressed. Such fun! We missed you Kyle, and I have no idea how I managed to keep that ice cream in my belly. No toppings for me! I cannot even tell you how much I love the idea of this race. Love it. I need to find more fun races like this locally – this would be about the only way to get my lazy boy middle child to step away from the screen willingly! My vote is that you grab the fam and come up here next July! Deal?